15.25 miles on the treadmill. Averaged 9 mph. Kept the incline at 2%. Wanted to do a little more but ran out of time between the end of work and having to pick up Abby at swim practice. Felt a little achy today. I'm just not a high mileage kind of guy. Need to remember to take what my body will give me and not force things. Super easy 6.25 miles in 49 minutes around the neighborhood, Nice run, felt good. 9.5 cold, windy miles around Sugarhouse Park. Felt stiff and achy at the beginning, but loosened up and felt great at the end. Would have liked to have run 14 or 15, but I have to go to work. PM: 5.5 miles easy with a few fast striders. I had to take the kids to the gym this morning since Ann worked last night and needed to sleep. As is becoming our Saturday morning routine, we went to breakfast at Chick Fil-A after. My kids love that place and I love me some chikin biscuits too (that's the way the cows spell chicken). Went to story time at the bookstore after that. Met Jake and Andrea at my house at 8:30 this morning. The plan was to run up Emigration Canyon and down to I-80. We bailed on that plan at the Hogle Zoo as the wind coming down out of the canyon was ridiculous and cold. Uphill the whole way is fine, but uphill into a 30 mph wind for 15 miles is just plain silly. So we hung a right just past the zoo and ran down Wasatch and back to my house. Andrea ran the first 10.5 miles with us and then Jake and I ran about 5 more in Sugarhouse Park. I was feeling pretty good and tried to push the uphills hard since I didn't get in much speed last week. Jake and I ran about 15.25 in 1:51. I did a little over a mile warm-up to give me 16.26. I really appreciate these occasional runs with guys like Jake and Fritz. I think it might give me a little edge this year. I really believe that the key to continuing to run well through your 40s is to add new elements to your training. Had pancakes after at my house. Jake and Andrea were good sports putting up with out noisy kids and smelly pestering neurotic dog. I'm going to take a rest day in order to rest restfully. Easy 4:45 am run - 7.25 miles around Sugarhouse. The Weather Channel said 25 and calm just before I left. Instead it was 25 and about 25 mph winds. Eating my Grape Nuts/banana now and watching Sponge Bob with Abby. PM: Decent workout over lunch - hardish but left plenty in the tank. I was supposed to run with the Avi8tr tonight but he bailed on me in favor of a warm run in Las Vegas. So I had to go it alone. 12.5 miles in 1:35 wandering around the neighborhood and SHP. Tried to run on grass in the park as much as possible. Cold, wet feet most of the way. Been thinking a lot the last couple days about factors that lead to marathon success and about it's about so much more than just being able to do this workout or that workout. Mostly it revolves around providing your nervous system with the correct stimulus at certain times in the weeks leading up to the race. I'll try to elaborate when my thoughts are more understood by me. Six miles on the treadmill starting at 8 minute pace and working up to 6:30 pace. Mostly an easy recovery run. Easy four miles around the park. Just shakin' it out. Beautiful day. Would have liked to have done more. 10K tomorrow. Easy mile jog just to loosen up. Now off to the SLTC Winter 10k. Arrived at Saltair a little late and so I had to rush around a bit at the start. Did a two mile warm-up jog along the course. There were fewer top guys this week than at the 5k two weeks ago and I thought Fritz was the only guy who would definitely beat me. 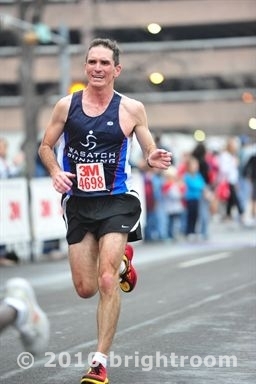 Neal Gassman was running and that put a little pressure on me because I don't beat Neal in 5ks or 10ks when he's fit. The gun went off and Fritz quickly opened up a big lead on his way to running around a 32 flat. I found myself in the strange situation of running with five or six guys. Usually I'm all alone in these races and it's like running a solo time trial. But I was really enjoying having the company. It was a little windy and there were several guys to tuck in behind. I could tell by the labored breathing of a couple of them that they wouldn't be around at the end. The problem was the pack was running a few seconds per mile slower than I wanted to be running. But I didn't feel like running by myself in no-man's land between Fritz and the pack having several guys fifteen or twenty yards behind. I knew that every mile I stayed with this group made it less likely that I would break 35, but I just couldn't make myself care that much. Too much pressure for wimpy me. So I just stayed with the pack. By about 3.5 miles everyone had fallen back except me and one other guy who I stuck behind. We were running really consistent miles. Every mile I ran the whole race was between 5:43 and 5:46 for a 5:44 average. I ended up third overall which is my highest finish ever in this series and won the masters which makes me the RRCA Utah 10k State Masters Champion. Won a $50 gift card and a coaster. I would have liked to have run 30 seconds faster, but the race just didn't shape up that way. I'm pleased with how the pace felt though and am optimistic that at Boston I'll be able to maintain six minute pace on the downhill, sea level course. The 15k in a couple weeks will be a better indicator. I'll get about 75 miles for the week. Makes nine out of the last ten weeks I've been over 70. Way more consistent mileage than ever before. PM: Three easy miles on the treadmill plus weights/strength training. First time I've lifted in 3 or 4 weeks so I only did about 50% of the normal volume. 1. Strength training good for old guys. 2. Strength training = Few injuries, less aches and pains. Ten miles in the concrete suburban jungle of Sandy Utah with some of my distance runners. I'm going to do some quality runs this week but also reduce my mileage a little bit. I want to focus on rest, recovery, and getting a little extra sleep. Managed 8.25 on the treadmill at lunch working up to 5:56 pace. Oh yeah, If I get approached by one more goofball at the gym trying to spread the gospel of the Vibram Five Fingers I'm not going to be responsible for my actions. Three times now! Twice was the same guy but still. PM: 6.25 miles around Liberty Park on the squishy wood chip path. 17.25 miles circling Liberty Park many times. Averaged 7:30. Got to the gym at about 7 AM and hopped on the treadmill. Warmed up for 3.25 miles starting out at 10 minute pace and working up to about 6:15 pace. Then I did 7 X 1 mile on the treadmill with a 1/4 mile jog recovery interval. Kept the incline at 1.5% on the intervals and 2% for the warm-up and recoveries. OK, I cheated and lowered the incline to 1% on the 5:15. 22.5 mile run this morning in 2:39. I wanted to run the same length of time I hope to run at Boston with a few marathon pace miles. Started at the dead end on the golf course road in East Canyon. Generally ran through East Canyon, up Little Mountain and down Emigration Canyon into Salt Lake but with frequent detours to make the run longer or more uphill. I did 4 x 1/4 mile at close to max effort going up Little Mountain. Ran mile 10-12 in 12 minutes. Ran mile 14 in 5:52 and kept in under seven minute pace the rest of the way. Ran mile 22 in 6:15 without pushing it too hard. Generally felt comfortable and in control the whole way. Good mix of uphills and downhills. So glad to have the day off to reflect on the grandeur of Chester Arthur, Benjamin Harrison, and of course, Warren G. Harding. Super easy four miles. Lifted and did some plyos after. Truly boring day here at work. Watching kids darken ovals with No. 2 pencils. I got a masters for this. Oh well, easy money I suppose. Just met Ann for lunch at Mimi's in Sandy. Now I'm a bloated pig which doesn't bode well for my workout this afternoon. Trying to work up the motivation to meet Jake on the track. Had to fight some homework battles with my daughter this afternoon so I wasn't able to make it to the track until Jake was wrapping up his workout. I did manage to run 600 meters of his last 1000 with him and I'm still suffering from it. Did some easy laps around the park with Jake and Adam after. Nice run. Legs still sore from Monday. Nine miles in 68 minutes around the neighborhood. Cool, but sunny and nice. Well, I'm very SAD today. So much so that I wrote sad in all caps. It turns out there's this organization called The National Civics League which awards "ALL AMERICA CITY" awards to 10 communities in the United States each year who "demonstrate innovation, inclusiveness, civic engagement, and cross sector collaboration by describing successful efforts to address pressing local challenges". Since 1949 when they began handing out the award, cities in 49 states and Puerto Rico have won the award. The only state that hasn't? UTAH. I discovered this while researching for todays lesson on the Progressive Era. Nice run over lunch. 8 miles in the Dimple Dell Gully. About 60 miles this week and only 4 on the treadmill. So that's good I guess. Just jogged a mile around the block. Heading out to the SLTC 15k now. 30 mph winds - and not a tailwind! I'm trying to find something positive to say - not happy with my racing intensity today. Ran the first 4 miles in 5:41, 5:41, 5:39, 5:39. Mile five in 5:48. Six in something like 6:18. Then Kevin caught me and I de-wimpified for a few minutes and ran mile 7 in 5:58 while drafting off of Kevin. Right hamstring started hurting and I ran mile eight in 6:02. Not sure what I ran after that as I lost interest in my splits. Kevin put about 30 seconds on me in the last mile. Walter Brown ran a good race and beat me for the masters win by about a minute. I thought of something positive - It was a good workout that I will get a lot out of if my hamstring doesn't tighten up more. Jake ran something like 48 minutes and Fritz ran around 50 flat - both really good times in today's conditions. Pretty inspirational. Was going to do a 4 mile cool down with Jake, Andrea, Fritz and Kevin but I turned around early because my hammy was hurting. PM: Went to the New Balance store and cashed in my gift cards from thr winter series this afternoon. Since all NB shoes are numbers an I don't have tha kind of brain that easily remembers numbers I'll just say that they are pretty cool - weigh just 9 oz. and really cushy. I like cushy. Went to the gym and ran 2.25 on the treadmill in my new New Balances and soaked in the hot tub. 1.Took Andy to Sugarhouse Park so he could play and ride his scooter. 2. Took Abby to Einstein Bagels to work on her math homework. Bought her a cookie when she finished. 3. Thought about running - but didn't. 4. Went to a movie alone. Saw Acts of Valor which I highly reccomend. I almost cried at the end. The movie definitely reminded me of the importance of not simply going through the motions in any area of life. 5. Had a candlelight dinner with the whole family. 6. Watched Abby and Andy do a lip sync Bon Jovi concert. Andy had a pretty cool Bon Joviish looking wig circa 1985. My kids are really into Bon Jovi. This is funny to me because back in the 80s I was heavily into the alterntive scene. But my kids don't much like The Replacements, R.E.M., or The Pixies. I was way too cool for any commercially successful band like Bon Jovi. 7. Enjoyed a fine IPA after dinner. 8. Ate a lot of Girl Scout cookies. 9. Thought about grading some essays - but the IPA destroyed my motivation. (That's two "thought abouts". It is the thought that counts right? 10. Put together (in my head) a lecture on the character and personality of Teddy Roosevelt - I always lecture without notes because using notes = Boring! PM: 8.25 mile trail run in the gully. This is an estimate as my 2 month old Garmin 405 doesn't work anymore. Early morning seven miler on the treadmill. PM: Another seven. Not too hard, but not too easy either. Just right. Will be very hard to get a run in today. 15 hour day at work.